Altogether nine higher secondary schools in Mizoram were shut due to an indefinite strike by an association. The association is demanding ad hoc status to these higher secondary schools. All the nine schools – Phullen Higher Secondary School (HSS), Farkawn HSS, NE Khawdungsei HSS, E Lungdar HSS, Thingsulthliah HSS, Tuisualral HSS, Zobawk HSS, West Phaileng HSS and Zawlnuam HSS – were established in and before 2004 and they have been looked after by villagers and civil societies in their respective villages for around 14 years. A statement of the Mizoram Govt. Lumpsum Grant-in-Aid Higher Secondary School Association (MIGLAHSSA) said that the villagers and civil societies have donated their own resources for the sake of education. “Even after more than ten years, the state government has done nothing to grant ad hoc status to these schools. The villagers and civil societies are drained and until the government grants us ad hoc status we will carry on our strike,” the statement said. Leaders of the association recently met education minister H Rohluna, who told them that the government was not in a position to upgrade the schools due to financial constraints and promised to look into the matter once the financial position is stable. 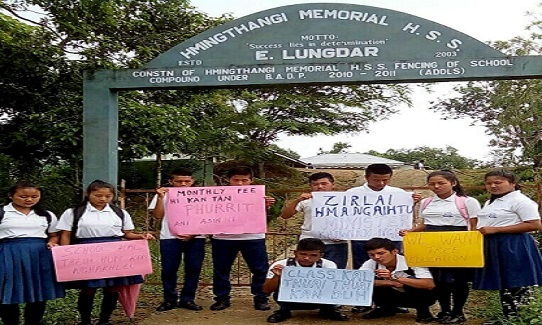 The strike has affected at least 850 students in the nine schools across Mizoram and is supported by villagers, all NGOs and student unions. Student bodies of the villages on Wednesday issued a communiqué in support of the association. “It has been a long fourteen years for these schools, the villagers, NGOs and other societies have been donating for the sake of education. It is high time the government does something for these schools,” the statement read.